Rose Colored Glasses is a lace sock pattern knit from the cuff down and is available in three sizes with circumferences of 7.258.25, 9.25 The pattern is written in chart form - line by line written instructions for the charts is not included, but if you need any help reading the charts, don’t hesitate to ask! I’m happy to help. The pattern features a main lace panel, eyelet columns, and columns of traveling zigzaggy stitches. The traveling stitches start in the cuff and continue onto the heel flap. If you are not comfortable with a patterned heel flap, a standard slip stitch flap could be substituted easily. Again, please ask if you need help with this modification. The pattern lends itself to both variegated and solid yarns. 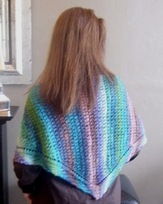 The pattern is also available as part of Knit Picks Independent Designer Program! You can download from Knit Picks here.